Spider-Woman (616) sticks to walls with an adhesive fluid excreted from her pores. Is there a comic-source for this? According to Comic Vine/Wikipedia, Spider-Woman (616) sticks to walls with a fluid excreted from her pores. Is there a comic-source for this? 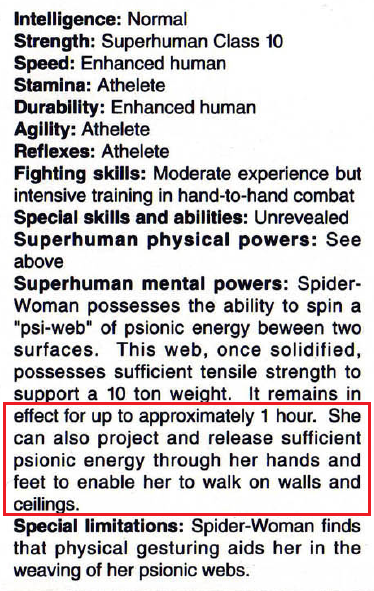 Other wikis indicate her ability is actually based in electrostatic cling or the enhancement of inter-atomic forces, but these explanations are essentially copied over from various Spider-Man handbooks about Peter Parker's ability to wall crawl. I'm fairly certain that, therefore, such explanations aren't canonical to Spider-Woman. 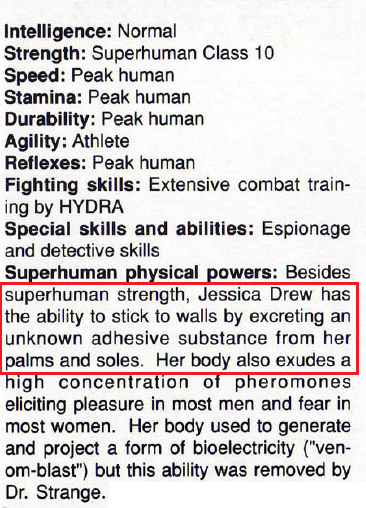 I'd accept them if I hadn't come across such an odd "fluid" based explanation of her abilities. This information is confirmed in multiple locations, not least in the 1992 Official Handbook of the Marvel Universe Master Edition Vol. 1 #8 where we learn that Spider-Woman (Jessica Drew) can exude adhesive material from her palms and soles (latterly she learns to cast them like Spider-Man's web shooters). The wikis may be confusing her web-crawling ability with Spider-Woman II (Julia Carpenter) who's described as having the ability to project a psionic field from her fingers that allows her to adhere to surfaces. Was there a one-off Spider-Man public awareness / anti-drug comic given away with chocolate pudding in the early 90s? Which was this comic where Spider-Man brought cookies for the Avengers?